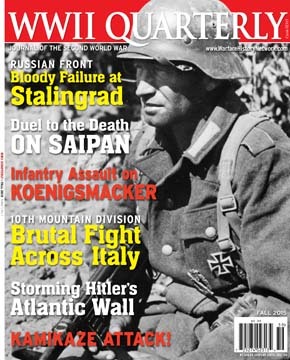 In this season's WWII Quarterly, Flint Whitlock shares with us his experiences touring the battlefields of Italy. I wrote previously about my guided three D-Day tours in the summer of 2014. I repeated the tour-guiding experience in May and June this year for the Minnesota World War II History Roundtable during a tour of Fifth Army battlefields in Italy. Although less well known today than the D-Day sites, the Italian battlefields are no less impressive—or important. This particular tour took us to the Operation Avalanche invasion site of Salerno, then moved northward to the huge palace at Casterta, where Lt. Gen. Mark Clark and his Fifth Army had its headquarters. We continued on to the mountainside village of San Pietro, which has been left in its destroyed state as a memorial to those who fought and died there. A new museum and hotel/restaurant have sprung up from the ruins. Our coach then climbed the steep road leading up to the Abbey of Monte Cassino, completely restored after being destroyed during the war. While in Cassino, we paid solemn visits to both the British and Polish war cemeteries. We stopped in Anzio to visit museums and the scenes of some of the bitterest fighting of the entire war. Then we paid our respects, on Memorial Day, at the American Military Cemetery in Nettuno, Anzio’s neighboring city. A stirring ceremony, attended by several hundred Americans and Italians, paid tribute to those who died during the struggles to free Sicily and Southern Italy. When we reached Florence, we toured the graves of more than 4,000 Americans who died during the battles that took place north of Rome in the 11 months after the Eternal City fell to the Allies on June 4, 1944. We discovered that it is impossible to visit a military cemetery without a tear in one’s eye and a lump in one’s throat. A month earlier I was in Weimar, Germany, to attend the 70th anniversary of the U.S. Army’s liberation of the Buchenwald concentration camp. Meeting the mayor of Weimar, the American ambassador to Germany, and some of the survivors (a couple of whom chose to attend wearing replicas of their striped camp uniforms) are experiences I won’t soon forget. The people who somehow survived their terrible experiences at the hands of the Nazis are world treasures who, sadly, are diminishing in ever accelerating numbers each day. Not too many years from now these eyewitnesses to an incredible, terrible era in human history will all be gone, which is why it is so important that we listen to them while they are still with us. I do hope that all of our readers will avail themselves of the opportunity to take a battlefield tour someday—and walk in the footsteps of heroes. Tags Anzio, Buchenwald, D-Day, Florence, Germany, Italy, Monte Cassino, Nettuno, San Pietro, Weimar.